The Milton Historical Society has a special interest in the Milton Pioneer Cemetery and have carried out work there in preserving early grave stones. The cemetery is on Bronte Street, north of the railway tracks at the P. L. Robertson property. The photos show the Pioneer Cemetery in 1984 prior to the restoration work and then on November 8, 1986 at the unveiling of the plaque and cairn for the restored “Bronte Street Pioneer Cemetery”. 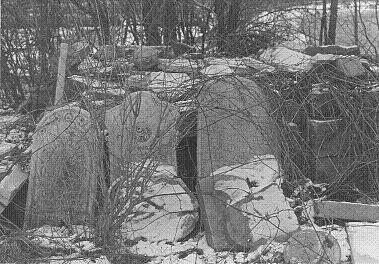 Prior to the restoration the grave stones were scattered about the property, many broken, many almost destroyed. After restoration, the property had been cleaned up and all the stones recovered and placed in a permanent concrete pad. Those that could stand erect were reset. The following document was recovered from the files of the Milton Historical Society on April 6, 2016. It has been transcribed (typo corrections added) from the original typed format. Presently, it is not known when this document was written and which “upgrade of the cemetery” is referenced in the closing paragraph. In 1822 Mr. Jasper Martin took up Lot 14 Con, 2 and settled in this locality. The following year, he built a grist mill and saw mill, and a little hamlet sprung up here and was called “Martin’s Mills”. Theses mills were a great boon to the new settlers. In 1837 – 1838 the population of Martin’s Mills was about 100. These people feeling their importance in the world, called a public meeting to decide upon a name for the town. The name “Milton” was suggested by George Brown, and was adopted. In 1830 a general store was opened by George Brown, and later a post office called “Milton” was established. The United Counties of Halton and Wentworth were separated in the year 1853 and Milton was selected as the County Town, and was incorporated by Act of Parliament in 1857. In due time the Court House, jail and registry office were erected on a site given by Mr. Hugh Foster. The Town of Milton is located on Lot 13 – 14 in the 2nd concession of Trafalgar, and is about seven eighths of a mile square. The first school house – a log one – was built on Lot 14 on the bank of the Sixteen Mile Creek. Mrs Harrison (then a widow) was appointed the first teacher, a position the worthily held for several years. During this period it was her custom to spend each morning and each evening in plying the shuttle, weaving for her neighbours, who in return performed work on the farm for her and her young children. Now that the town was incorporated and was chosen as the county town, the next step was to purchase a cemetery, so a parcel of land was selected from John Martin, situated on the bank of the Sixteen Mile Creek on Lot 14 2nd Con, of the new survey, measuring one half acre. The sale was made to Edward Martin, William Dempsey, and Johnson Harrison, dated 19th day July, 1860. Later the deed was made out dated 2nd June, 1871 between Jasper Martin of the Town of Milton and the three trustees of the burial ground, Thomas Rixon of the Township of Nelson, William Dempsey, and. Johnson Harrison of the Township of Trafalgar. Twenty dollars of lawful money of Canada was paid for the lot. In this cemetery, many of our pioneers are buried, men and women who suffered many hardships in clearing the land and settling the country and who had qualities that fitted them to assist In the moulding of the life of the new community, They showed true nobility of nature and had faith as clear as it was strong. The first burial was Mr. Thos. Harrison. Other leading citizens were – John Martin, who built the first saw mill and the first grist mill; George Brown, first mayor, county treasurer, and first store keeper; Mrs Harrison, first school teacher and Mrs Coates, who started the first Sunday School; Dr. Cobban, first medical doctor. 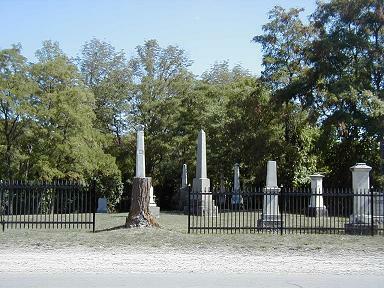 For many years the cemetery was neglected, scarcely anyone taking any interest in It, for many of the sons and daughters of the pioneers had left the community, so the members of the John Milton Chapter of the Order of the Daughters of the Empire decided to undertake the task of Improving Its present condition. A committee was appointed consisting of Mrs. E. E. Yates, Miss A. Blain, and Mrs. M. E. Gowland.. A committee was also appointed from the Town Council consisting of Mr. John Irving, Mr. John Maxted, and Mr. Ed. Syer. These committees with Mr. R. E. Harrison, the only living trustee of the cemetery, went to the cemetery and looked it over thoroughly and reported to the Chapter. After due consideration of the report the members of the Chapter acting on the advice of those directly interested and the Town Council, decided to proceed as follows – All the brush was cut and cleared away, the ground levelled., and a suitable fence placed along the front. 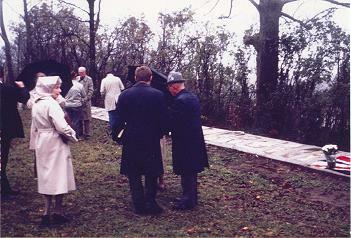 The next step was to get In touch with the friends and relations of those buried in the cemetery. It was then decided to send printed letters informing them of its condition and asking for donations to assist in restoring it. The response, which was so generous was greatly appreciated and with a donation from the Chapter enough funds were available to cover all expenses. A letter of thanks was sent by the treasurer, Mrs. E. E. Yates, to each one who contributed. Much credit is given to the committee for their co-operation and watchful care and assistance in the work. Now that the cemetery is restored, and in good shape, the Town Council promised to assume the responsibility of the perpetual care of it. The members of the Chapter trust that the old cemetery will be an attractive spot and that the friends of those lying there will be proud to visit it.